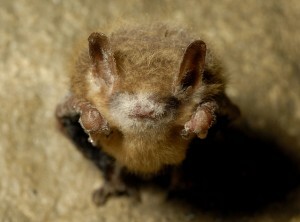 In the latest good news about white-nose syndrome, 150 bats that were cured of devastating disease are slated to be released back into the wild this Tuesday, May 19th. The bats, collected from Cameron Cave in March, were subjects of research that looked to naturally occurring anti-fungal volatile organic compounds (VOCs) to compete with the Pseudogymnoascus destructans, the fungus responsible for causing white-nose syndrome in bats. Researchers from Georgia State University’s Crow Lab working with US Forest Service scientists found a common soil bacterium, Rhodococcus rhodochrous had a tremendously positive effect when grown on cobalt. Even at very low concentrations, the VOCs the bacteria released into the air as it grew were enough to prevent or reduce white-nose syndrome in bats located nearby. The next step is to determine what specific chemical created from the reaction is having the miraculous effect and to isolate it for potential use on a larger scale. Meanwhile researchers from the University of California in Santa Cruz are looking to another bacteria, isolated from the skin of bats thought to be immune to WNS, as a way to inhibit the disease. Discovery News reports that the cured bats, half of the original 300 collected, will be released at 7:30pm at Missouri’s Mark Twain Cave Complex. it will also treat the cave.